I prepared this stew with boar meat, because boar reminds me of autumn in Europe when it’s the season of la chasse – or hunting season. Like most game, boar is lean and has a slightly gamey flavor. It benefits from slow cooking and pairs well with powerful aromatics such as juniper, winter fruit and spirits, such as Calvados and Armagnac. If you cannot find boar meat, pork is a good substitute. 1. Combine the prunes and Armagnac in a bowl and let stand at least 1 hour. 2. Preheat the oven to 325°F. 3. Season the pork on all sides with salt and pepper. Heat the olive oil over medium-high heat in a Dutch oven or oven-proof pot with a lid. Add the pork in batches, without overcrowding, and brown on all sides. Transfer to a bowl and repeat with the remaining pork. 4. Pour off all but 1 tablespoon pork fat from the pan. Add the bacon and sauté until its fat renders. Add the carrots and onion and sauté until the onions soften and the carrots are crisp tender, 4 to 5 minutes. Add the garlic and sauté until fragrant, about 1 minute. Return the pork and any accumulated juices to the pan. Add the prunes and Armagnac, the wine, bay leaves, bouquet garni, 1 teaspoon salt, and 1 teaspoon black pepper. Bring to a boil, then reduce the heat to a simmer, cover the pan, and transfer to the oven. Cook until the meat is very tender, 2 1/2 to 3 hours. 5. Remove the stew from the oven, discard the bay leaves and bouquet garni, and taste for seasoning. Serve warm with mashed potatoes or polenta. 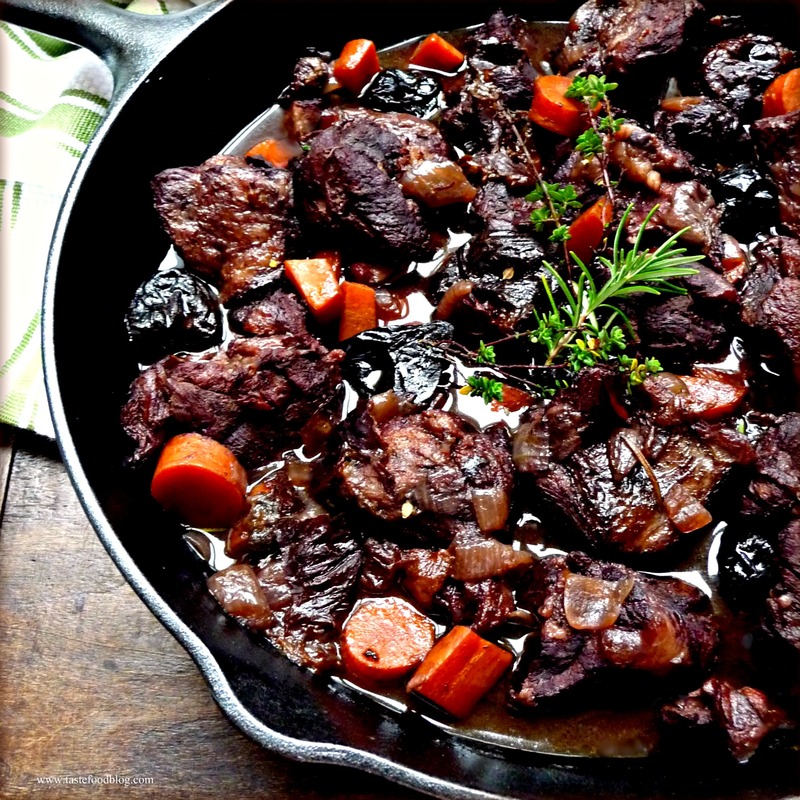 You hit all the right buttons with me here – love a nice stew, and prunes + Armagnac… WOW! Just pinned your post so I won’t miss it…. Pork (and boar) goes so well with prunes and the armagnac! I had a dinner party Saturday night and served roast pork and hardlikearmour’s pickled prunes on the side. Fantastic combination. With stew weather upon us, this is a perfect dish!! Happy Monday to you! A marvelous dish! Armagnac and boar, what a fabulous and tasty combination. Wow, this is simply stunning. I just stared at that picture for awhile! look at that colour! packed with tastiness! This looks outstanding. I’m always doing my pork shoulder the “same old” way I always do it, thanks for the new idea/inspiration. Did you do the entire recipe in that cast iron pan? No I didn’t, but I did reheat it in the cast iron pan. Lynda I’ve never had boar, but that’s one beautiful stew! What a perfect fall meal, Lynda. I simply love the colours and prunes and Armangnac sound like the perfect pairing. Really gorgeous! Yummy! Never had boar, but I’m sure it would make a great stew! This looks delicious!! Gorgeous looking stew, Lynda. I absolutely love boar but have been unable to find it here i California, the same goes for venison and hare (not to mention horse meat ;-0). Do you have any reliable suppliers that you could recommend? Thank you, Lynda. Will check it out. Perfect for cold days… Yumm…. Oh man….I wish I could just crawl into that skillet and start eating! Now all I need to do is decide which friends to invite to share this with us. This is the most delicious looking dish I’ve seen in a long time. I have a freezer full of wild hog right now. I’ve never heard of Armagnac before but I’ll definitely be looking for some now. Thank you! My kitchen smells so wonderful right now and I’m loving the heat from the oven!!! 🙂 We cannot wait to EAT it!! I read the post on where to get boar- just curious on my second question…. is there a marked difference between Armagnac and brandy? YUM!